I have always admired Nelson Mandela for his commitment to freedom and equality, as well as for enduring so many years of unjust imprisonment without succumbing to bitterness and anger. After reading his 600+ page autobiography, I'm even more in awe of this man who sacrificed so much for what he believed and maintained an incredible optimism throughout the hardships. While it was fascinating to learn more about Mandela's early formative years - how he became the freedom fighter he was - I was completely captivated by his retelling of his trial and incarceration. His dignified attitude and continued commitment to freedom were inspiring. "Prison," he says, "was a kind of crucible that tested a man's character. Some men, under the pressure of incarceration, showed true mettle, while others revealed themselves as less than what they had appeared to be." Mandela was one of those refined by the "pressure of incarceration" and his unshakable faith in basic human decency, even among those who would be seen as his enemies, is evidence. I always tried to be decent to the warders in my section; hostility was self-defeating. There was no point in having a permanent enemy among the warders. It was ANC [African National Congress] policy to try to educate all people, even our enemies: we believed that all men, even prison service warders, were capable of change, and we did our utmost to try to sway them. Despite all of his accomplishments, there is a wistful strain that runs through the book whenever he talks about his family, who he said "paid a terrible price, perhaps too dear a price for my commitment." I wondered--not for the first time--whether one was ever justified in neglecting the welfare of one's own family in order to fight for the welfare of others. Can there be anything more important than looking after one's aging mother? Is politics merely a pretext for shirking one's responsibilities, an excuse for not being able to provide in the way one wanted? While he was in prison, separated from his family for more than two decades, his mother died, his oldest son died, his wife Winnie and other family members were harassed constantly. In May 1984, he was finally allowed to be in the same room as his wife during a scheduled visit, and for the first time in twenty-one years he was able to touch, hold, and kiss her. It seems to be the destiny of freedom fighters to have unstable personal lives. When your life is the struggle, as mine was, there is little room left for family. That has always been my greatest regret, and the most painful aspect of the choice I made...To be the father of a nation is a great honor, but to be the father of a family is a greater joy. But it was a joy I had far too little of. The adjustment to life after prison, rejoining a world that had moved on socially, technologically, and personally without him, was a challenge of course, but again, Mandela embraced the positive. For example, "Television had shrunk the world, and had in the process become a great weapon for eradicating ignorance and promoting democracy." This brings to mind the power of social media today and the opportunities it presents to spur real change. 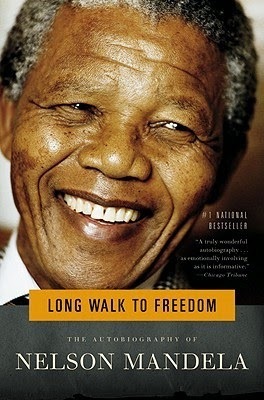 There's far too much in Long Walk to Freedom to even come close to touching on in this review, and it was not a quick read at all, but I am glad to have a better understanding of this extraordinary man. He left the world a better place, and made great personal sacrifices to do so, because he truly believed that, in spite of all the evidence to the contrary in his own life and country, people are good at heart. I never lost hope that this great transformation would occur...because of the courage of the ordinary men and women of my country. I always knew that deep down in every human heart, there is mercy and generosity. No one is born hating another person because of the color of his skin, or his background, or his religion. People must learn to hate, and if they can learn to hate, they can be taught to love, for love comes more naturally to the human heart than its opposite. Even in the grimmest times in prison, when my comrades and I were pushed to our limits, I would see a glimmer of humanity in one of the guards, perhaps just for a second, but it was enough to reassure me and keep me going. Man's goodness is a flame that can be hidden but never extinguished.